What's New on the CTQG Web Site ? Nominations for the 2014-2015 Board & Committee Chairs available Here. Quilting in Space? Click HERE to learn about Astronaut Karen Nyberg's invitation to submit your own star block to a global community space quilt to commemorate the 40th annual International Quilt Festival in Houston in 2014. Just received a thank you notice from Coweta Pregnancy Services for the 2 quilts we donated for their recent Silent Auction fundraiser. They raised over $6,100 at the Silent Auction and the event raised over $40,000 in total. Show and Tell Pictures from the May 19, 2014 meeting. Linda Burns says:Ever wonder what the Guild’s secretary does? About once a month we have a board meeting at someone’s house and I get to record all the fun we have! Picture this: 10 - 12 quilters gathered around a table yakking and snacking about our guild while trying toplan programs, Saturday Sew-cials, auctions, and lots of other exciting activities. You can’t ask for a better position in the guild than being the secretary! JoAnn Schrepfer , Event Planner writes:What I love about being the Event Planner for our guild is planning the next party. Oops, I mean planning the Saturday Sew-icals. Of course there is a real party for the Guilds Birthday to arrange, that's a lot of fun. Oh, don't forget the biggest party of the year, the Chinese Auction. Do you have the same party gene I have? Maybe being the next Event Planner for Common Threads is in your future. Check it out, I always have the best time setting up the meetings and getting to be Sewical with everyone. Jo Glass, program Chair writes: It's lots of fun, and very interesting to research speakers for the Guild meetings, and make the arrangements for when they visit. it isn't as much work as you might think, and lots of Guild members are glad to offer suggestions for speakers. Sometimes it's a challenge to stay within the budget, but there are a lot of creative ways to make it work. Do you want to join the Yahoo email group for the Guild? If so, please email JoGlass101@gmail.com for an invitation to the yahoo group, which is used only for emails re Guild news and business. The Cherokee Rose Quilt Guild invites you to a Quilt Show in Thomaston, GA on June 13 & 14th. The "Presidential Pathways Quilt Show" will be held at the Thomaston - Upson County Recreation Department from 10am-5pm both Friday and Saturday and admission is $5.00. They will have many vendors in attendance, as well as a boutique featuring handmade items and door prizes. We are fortunate that a couple of women from that guild will be at our May 19th meeting and have agreed to take submitted quilts with them!! That will save you a trip to Thomaston to drop off your entry. If you can't make it by the 19th, you can drop off your quilt at the Southern Stitches Quilt Shop. They request that you get it there by June 2nd. Pictures from the May 19, 2014 Meeting. 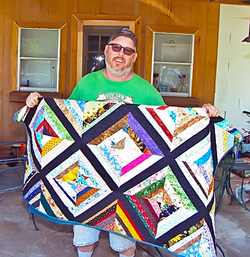 Jeffre Coggin, cancer patient, ( cousin of Jo Glass' husband Dan, and friend of Colette Parent-Hay's husband Freddie) displays the compassion quilt he received from the CTQG in May. The quilt was donated to CT by Newnan Heartstrings. At the time he was given the quilt, he was told "We hope this will be like being hugged by 50 women you don't know, but who want you to be comfortable while undergoing your treatments". he was very touched, and grateful, as was his family. Gail Lane, member of the Community Service Committee with Cindy Armstrong and Jane Hendrix talks about that Committee: At Community Service we have so much fun getting together with other quilters in our guild for fellowship and fun while working on various projects. Whether we are working on string quilts, baby quilts, or Fallen Soldiers quilts, etc. it’s all for a common cause. It is so satisfying knowing these quilts will be keeping others warm on cold winter nights.